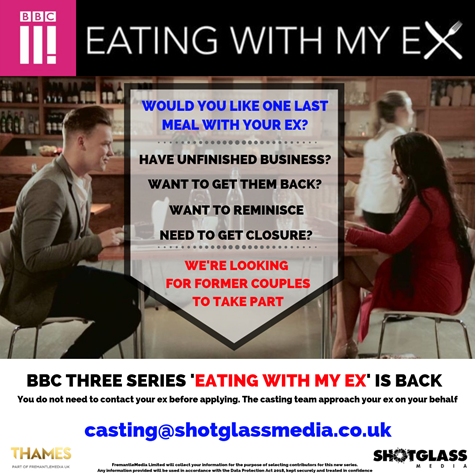 Eating with my Ex are looking for people for their next series, could it be you? BBC Three are currently in production with a unique format and they’re casting for people across the country to invite them to feature in the series. The Bafta-nominated BBC Three series, ‘Eating With My Ex’ has been commissioned for a 10-episode long-form series after it’s short-form version went viral online. The show reunites former couples to sit down and have one last dinner with each other, and to discuss their relationship in an honest and open conversation. The popular short-form series online has racked up nearly 20 million views and is hugely popular with the 18-35 age bracket. The experience isn’t as scary as it sounds and in fact the couples who do take part walk away with closure, answers to their questions and in some cases.. a rekindled romance! This is a genuinely heart warming and lovely format and they’re excited to give our lucky readers the opportunity to apply for it.